A lot has changed in West Africa since the demise of Swissair, Sabena and AirAfrique . New companies are coming and going, for the time being it is very difficult to keep this page updated. Also it is no longer possible to fly via Togo with KLM. Aeroflot, in earlier times the biggest company with most of destinations over the the world, which today serves neither Bénin nor Togo. 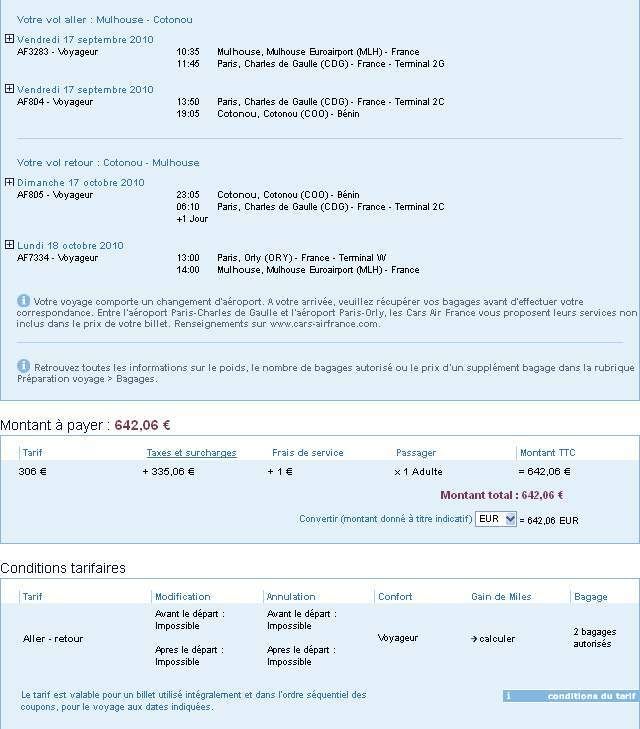 5 times weekly, Mo, Tu, We, Fr & So, (since 2009 again 5 times) with connections in Paris to many European cities. 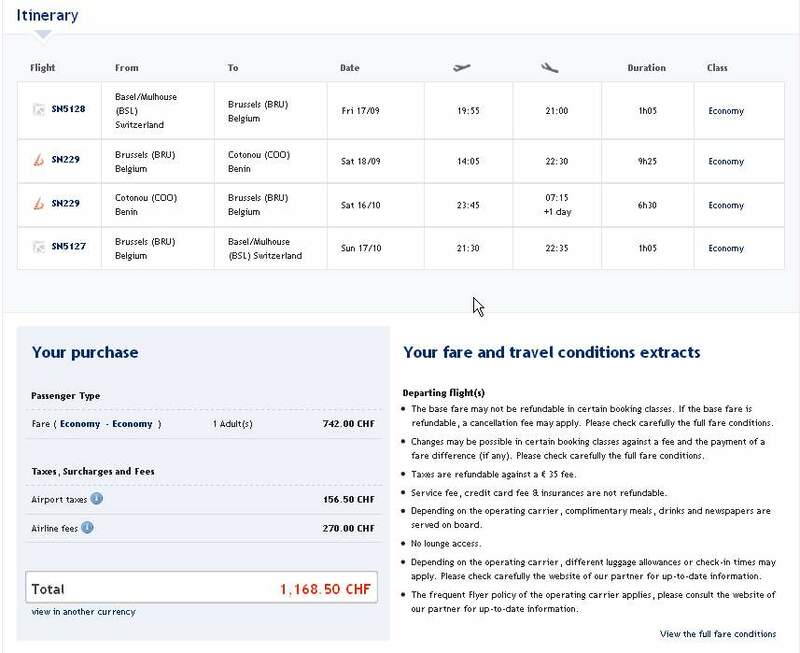 The tickets are now sold to the same price for a validity of up to 12 months, but there is no right, even not with an addional fee, to modify or cancel these tickets. 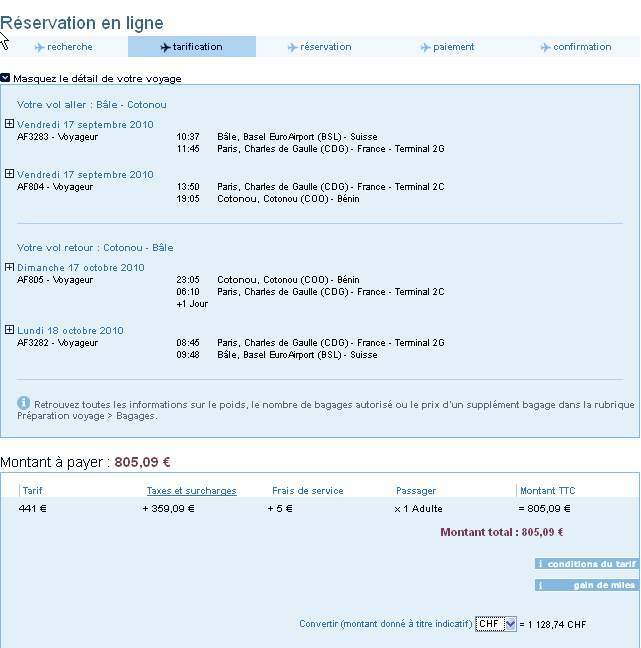 Only from CDG, a modification, annulation is possible for 200 Euros each. Attention, there is no flight at Thursday, this is a technical flight to Lomé, it stops at Cotonou, but only for the personnel of AirFrance! Please note : A new luggage system has been introduced since 1st of November 2005, 2 pieces of each 23 kg (or 32kg in Business Class) are allowed. Each of the two pieces may have a weight up to 32 kg (Economic), then a supplementary fee of 50 EUR is applicable for each of them. Additionally Notebook and Hand luggage up to 12 kg. An additional tax has to be paid for a third piece of luggage up to 23/32 kg of 125 EUR for 23 and 175 EUR for 32kg. 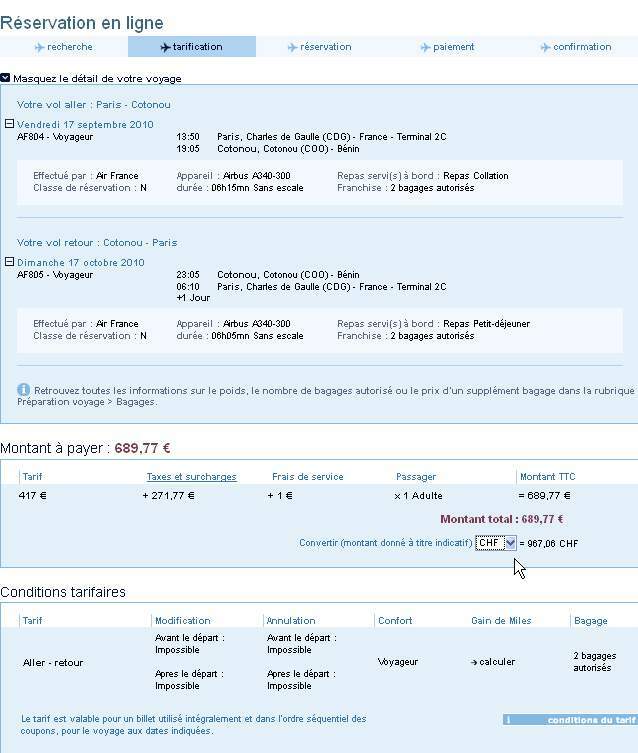 *) Flight rates down to 850 EUR (600 EUR for 2007) may be found in the internet, but they are sometimes very well hidden. Try to make a flight reservation 15 to 30 days in advance and a stay from one weekend to 30 days! Check carefully and make several requests, it is really worthwhile. There are now only small differences of a few Euros from the cheapest to the most expensive flight. There is only a difference of about additional 30 Euros for the fligth back at friday. Ghana International Airlines, ex Ghana Airways. The new airline serves only one times weekly from London to Accra (no flights from Düsseldorf anymore). offers from time to time economic flights from Basel - Mulhouse and from Paris to Cotonou and Lomé. 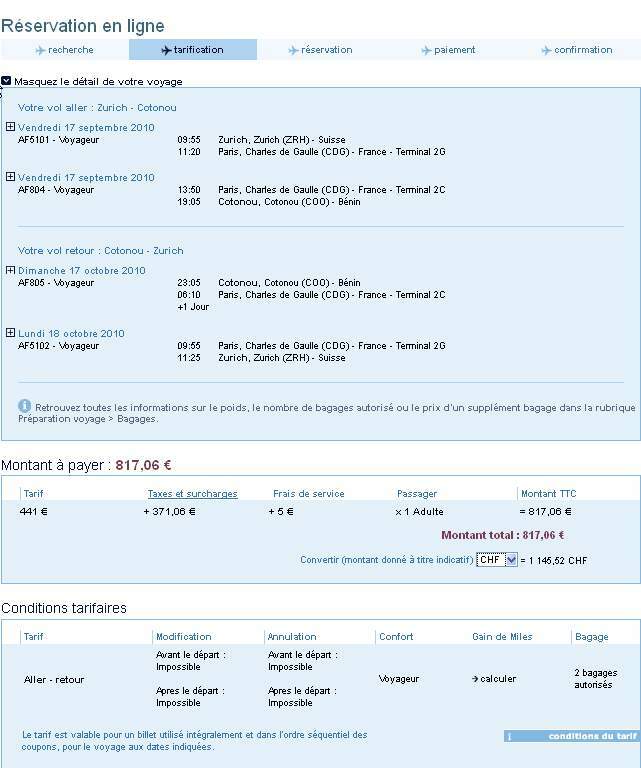 Their website displays flights to Togo only ! Better information than in the web is available by telephone in the office at Mulhouse (F). Point Afrique, (ca. 750 - 800 EUR, no meals). The company does not fly itself, and does not have a service all the year. You can bring up to 40 (to go) and 30 kg (return) of luggage! 40 kg for return has to be paid. 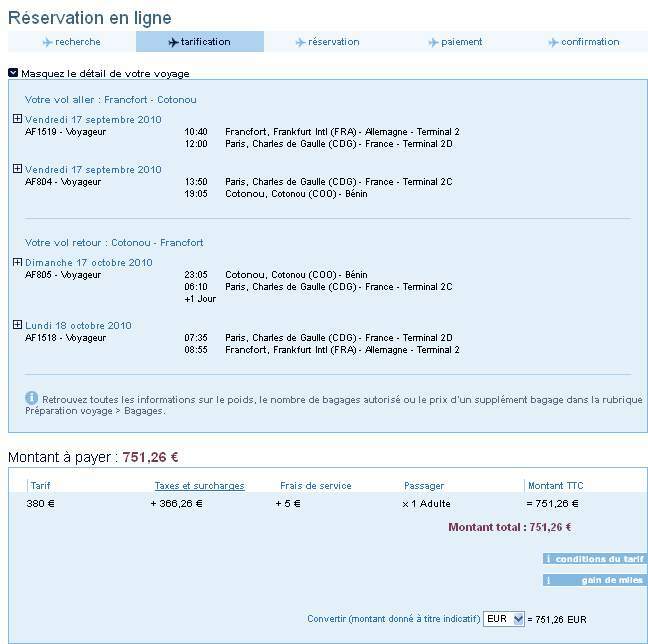 offers flights from Europe (Frankfurt, Geneva, Lille, Lyon, Paris and others, not Basle) to Cotonou via Casablanca five times a week (Mo, Tu, We, Th, Sa). 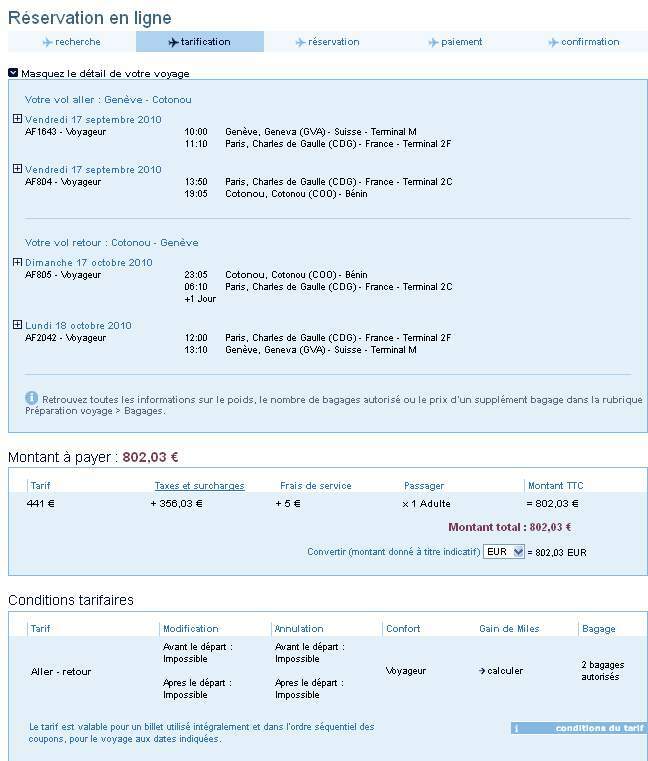 The flights are now noted in the Internet, but there is no online reservation, nor is a pricelist available. A new company appearing on the sky recently, we have no experience up to now. It is not sure whether the company is flying itself or has a service all the year. Check if its not something similar to • Afrique Airlines or • Air Togo above. 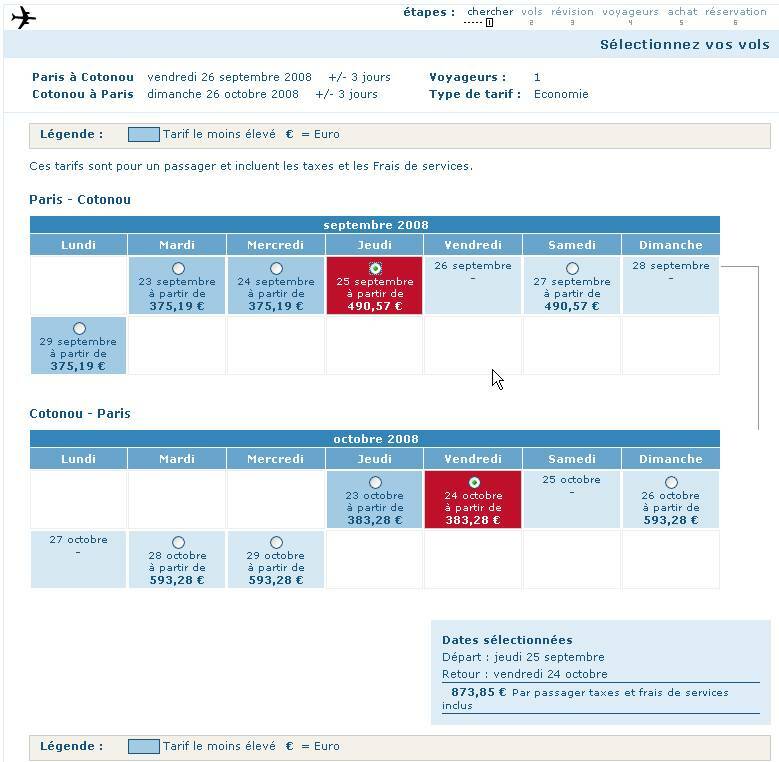 Since a short time there is a new star on the flight heaven, the prices are only very cheap with a flight from Bruxelles. Fro transfer flights from other European cities are extremely additional fares to pay. See the example for a flight from Basel-Mulhouse. Check also some additional fees. - We do not recommend flights with a change of airplane in Lagos (Nigeria) for newcomers in Africa. - There are a lot of inner - African flights, specially from and to countries of West Africa. - There are no flights inside of Bénin, the only other airport is in Parakou (for small aircraft only). - There are different sites which take requests for cheap flights, but I didn't find any cheaper flights than described above! - For economic tickets and good advice ask at Globetrotter Travel Service or via mail in Zürich at "zh-loewenstrasse@globetrotter.ch". Please refer to "Au Jardin Helvetia". - Search for fligths by Google on a separate page, then please click here.